The Legend of Zelda: Breath of the Wild is one of the best games to come out in recent years, and much of the praise for the game is due to the systems created by Nintendo. Stasis, Magnesis, Cryonis, and Remote Bombs all come together in BOTW to form the ultimate toolset for gamers who want to experiment in the open world of Hyrule. The latest viral video exploding on social media today comes from a Twitch streamer who goes by Zant. 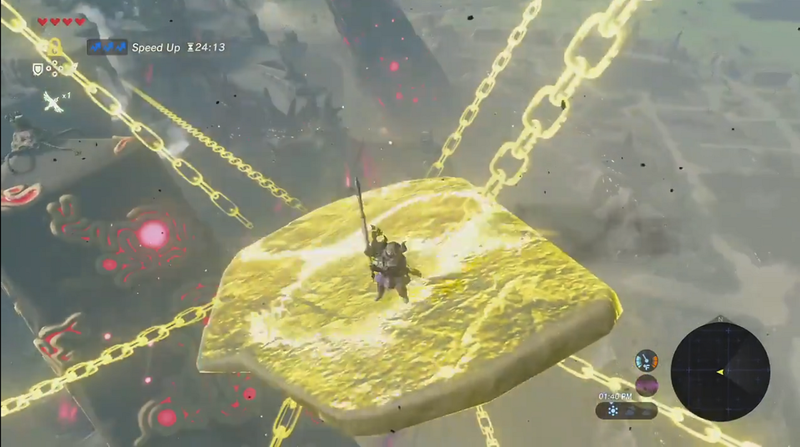 In a clip posted to Twitter yesterday, Zant shows everyone how to catapult Link up to the top of Hyrule Castle with some bananas and a bunch of well timed moves. Please take a look. How does Zant do it? Luckily, he posted a very detailed explanation of the series of moves required to execute this awesome maneuver. The entire premise of this clip is based around resetting the stasis cool down timer, allowing link to stasis objects immediately after he flies off with them. At the start of the clip, I place a Banana on the slab and cook it with a flameblade, but we'll get back to the banana in a second. Next, I stasis the slab and hit it a bunch of times with a Double Axe. Before doing the spin attack here, I stand facing away from the slab to get 2 hits per spin, decreasing the time it takes to get a red stasis arrow. Finally, I shoot an arrow upwards to set the trajectory that the slab will fly. At this point, it mostly seems like a typical stasis trick, however the moment that the slab lifts off of the ground, I pick up the newly cooked banana, giving me an item popup screen since this is the first time I have picked up a cooked banana on this file. This popup screen resets the stasis cool down, allowing me to immediately stasis the slab again, which I do once it reaches its peak. Next, I hit the slab some more, and drop a bomb underneath to set the angle upwards, then ride the slab up some more, this time using a tooltip popup from the amiibo rune to reset the stasis cool down once more. The first use of a this rune on a new file creates this popup, which resets the stasis cool down just like the new item popup from the cooked banana. From this point, I setup another launch, and ride the slab upwards slightly, and finally jump at a specific time to get launched towards the castle. After getting launched, I buffer lag frames from looking at the castle using the quick menu, then pause the game and pull the glider on the next frame. Doing so lines up this action with a lag frame, which transfers a compensated value into Link's gliding speed, essentially doubling his flying speed on the way to the top of the tower. This is quite a complicated trick, and this kind of (trick) is the result of tons of work and research that has been done by the Breath of the Wild Speedruning community. Truly a representation of what's possible in this game. This is definitely one of the coolest examples of how BOTW's systems can be manipulated to do all sorts of awesome things in the vast open world of Hyrule. Congratulations to Zant for showing everyone how to do it for Shacknews. Be sure to check out more zany Zelda antics on Zant's Twitch channel. It is no surprise that players are still figuring out amazing ways to reach new heights in The Legend of Zelda: Breath of the Wild, our Shacknews GOTY 2017. I love that there are people out there that even have the desire to figure something like this out... i'd never even think to try something like this.